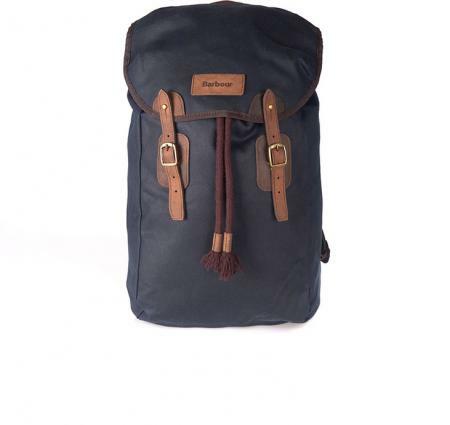 Barbour Wax Leather Backpack in Navy. The Barbour Wax Backpack is a classically styled design that's superb for weekend trips and overnight stays, in addition to being a great gym and everyday bag. Crafted from a fully waxed cotton canvas outer, it is both extremely durable yet lightweight and boasts genuine leather strap closures with magnetic fastenings and Barbour branding. Containing a drawcord inner slip pocket that's perfect for stowing laptops and similar electronic devices, the lining showcases an exclusive Barbour tartan cloth for a luxury finish. Adjustable straps ensure a comfortable and precise wear for optimum fit. Available in either navy blue or stone. Please make your choice of colour using the pull down menu below.SALE!